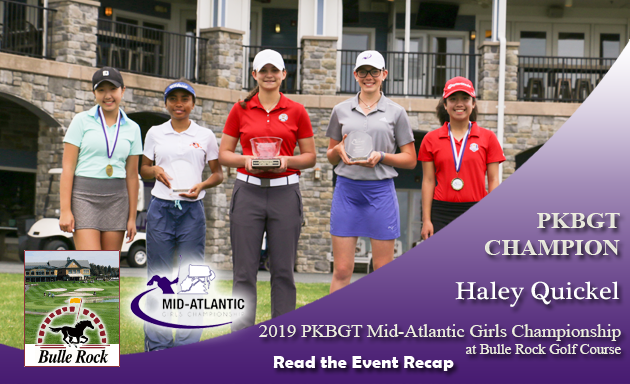 On Saturday, April 13, the Peggy Kirk Bell Girls’ Golf Tour played the first round of the 2019 Mid-Atlantic Girls Championship at Bulle Rock Golf Course in Havre de Grace, MD. 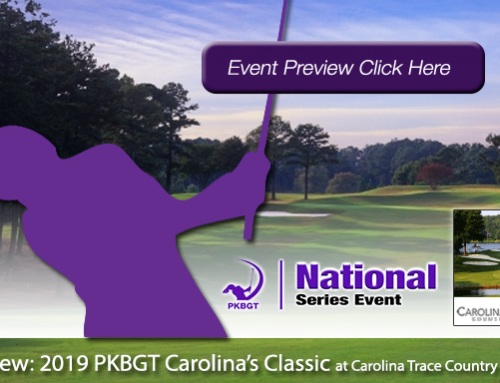 Lined by a channel of water along the left-hand side, images of Annika Sorenstam walking up the 18th fairway of Bulle Rock Golf Course to roaring applause from spectators resonates through across the facilities. The course, tucked away behind office complexes and local strip malls along the bustling streets of Havre de Grace, emits a majestic glow with carefully crafted walls of boulders separating the vibrant green grass from vast bodies of water. The historic former home to the McDonald’s LPGA Championship tests every asset of the golfer’s arsenal. Tee shots daring players to risk it all, cut the corner, and clear the water. Massive, winding bunkers precisely placed along the fairways and around the greens. Dipping, diving ridges and valleys along the lightning-quick greens. The average player shivers at the very thought of staring down a challenge with Bulle Rock. 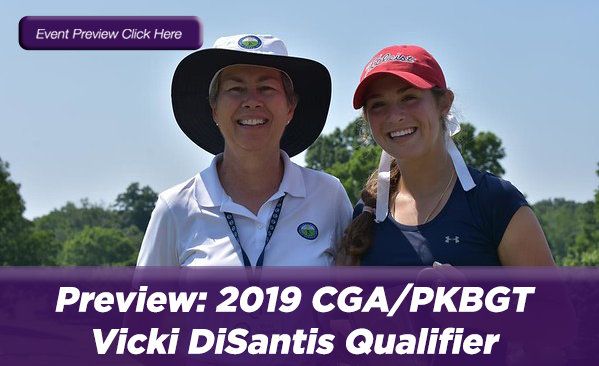 For the field of 45 at the 2019 PKBGT Mid-Atlantic Girls Championship, they embraced the 18-hole head-to-head battle with one of women’s golf’s fiercest layouts. 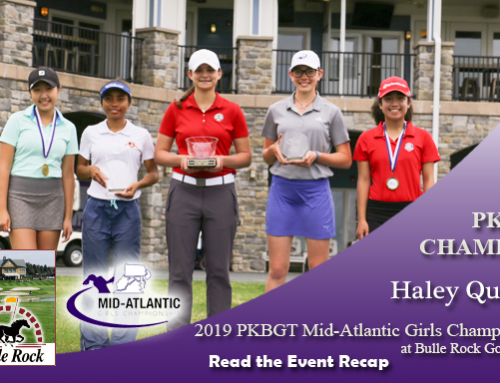 The PKBGT Championship event, in partnership with the MAPGA and the MSGA, was welcomed by grey, gloomy clouds and a slight mist. Players checking in just outside the Bulle Rock pro shop were treated to the very sight of the final 18th green through the hazy, eerie atmosphere. As the 11 a.m. tee time rolled around the clouds began to lift, replaced by glaring rays of sunshine and bright blue skies. 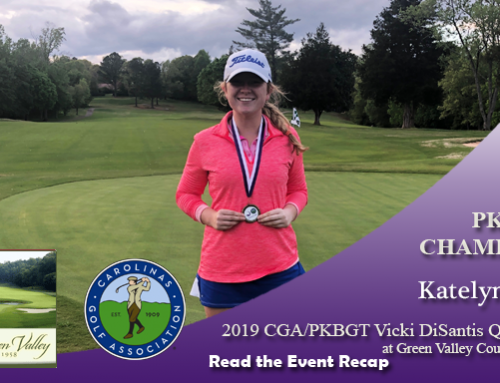 The best of the PKB’s Mid-Atlantic displayed flashes of Anika herself, handling the date with an LPGA challenge with poise. Take a look at how the leaderboard stands following the first round of play! 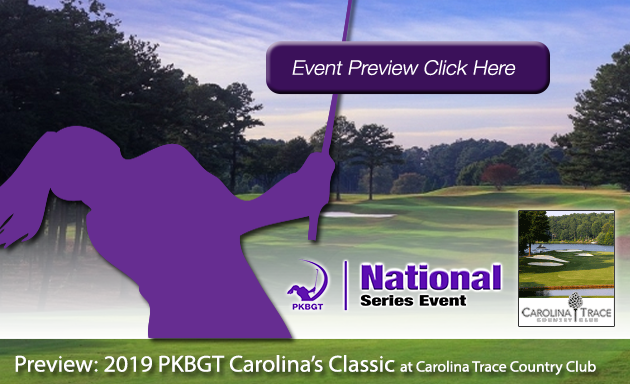 Shooting even-par 72 on the day and leading the 27 player Bell National field following the first round, Faith Mcilvain (Ellicott City, MD 2020) set the tone early with a birdie on her first hole. The first of four birdies on the day, Mcilvain made the turn at one-under par. Kicking off her back nine with a bogey wasn’t the ideal start she was looking for, but Mcilvain held her composure, and the lead, for the remainder of the round. The Delaware duo of Hannah Lydic (Ocean View, DE 2022) and Haley Quickel (Middletown, DE 2020) finished the first round in a tie for second place after posting scores of 73 (+1). Just one stroke behind Mcilvain for the lead, both girls are in the running for the championship title in the final round. 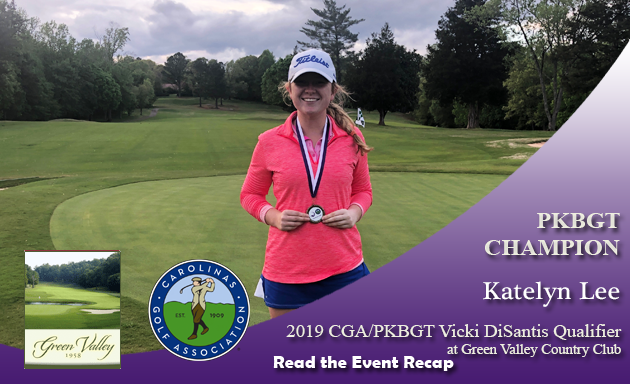 Lydic closed out her round with three birdies in her last four holes, while Quickel sprinkled two birdies into a solid round with very few blemishes. 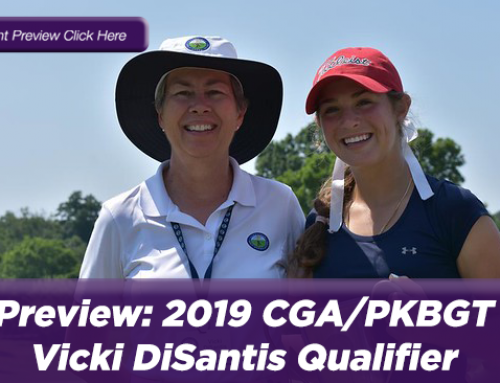 Rounding out the Bell National Top Five, in a two-way tie for fourth place is Paris Fieldings (Suffolk, VA 2023) and Megan Meng (Pennington, NJ 2024) with scores of 74 (+2). Fieldings had three birdies in her round and Meng had two birdies on her front nine and a very clean back nine. Both players are just two strokes off the lead and can make a push for the championship on Sunday. Leading the 18-player Futures National field with a first-round score of 74 (+2), Josephine Nguyen (Springfield, VA 2024) found her stride on the back nine, finishing with a two-under-par 34. After starting her day with a birdie on the first hole, Nguyen sits in control entering Sunday. Christina Cupelli (Fairfax, VA 2021) sits in second place following a first-round 78 (+6) performance. Cupelli scored three birdies on her front nine, a strong start that put her in position to contend from the get-go. After a first-round score of 80 (+8), Katie Vu (Fairfax Station, VA 2024) sits in third place. Vu’s back-to-back birdies to start the back nine were vital in her push toward the top of the leaderboard. In fourth place with a first-round score of 81 (+9) was Sarah Lydic (Ocean View, DE 2024). Lydic birdied the eighth hole, her best of the day. 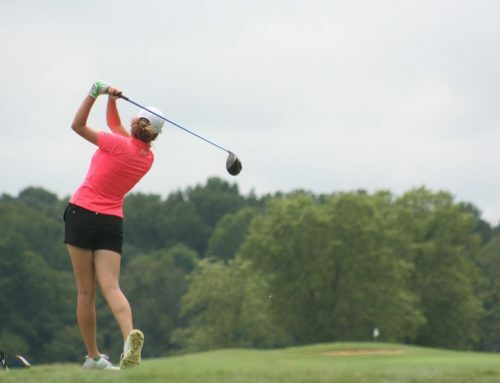 Rounding out the Top Five in fifth place with a score of 82 (+10) is Taylor Park (Fairfax, VA 2022). Park birdied the 16th hole to jump to the Top of the leaderboard. The championship is up for the taking in Sunday’s final round. Will Mcilvain hold off the rest of the field? Will someone make a push in the Futures National division to challenge Nguyen? 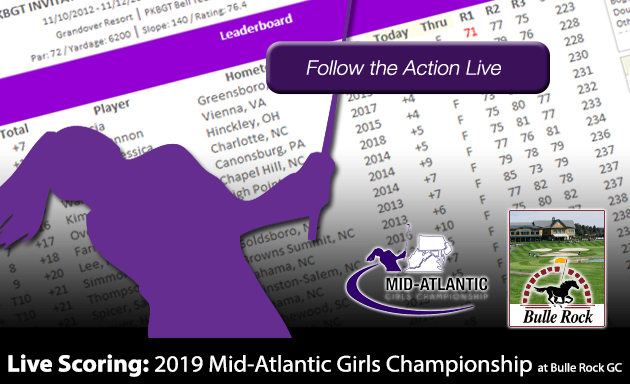 18-holes of golf separate one player from the 2019 Mid-Atlantic Girls Championship. Stay tuned to the leaderboard and live scoring to see how it all plays out!